The design and reliability is the same as the legendary Navigator watch produced by Marathon in various forms since the late 1980s and features a date window as well as red tipped seconds hand. Marathon watches are still genuinely 100% Swiss made at their own factory in the heart of the Jura Valley. With many components made in-house including their own Tritium tubes, famous for the brilliance of their long lasting illumination. The timepiece features a high-quality Swiss made high precision 3 jewel Quartz Movement (ETA caliber F06.111) designed to withstand high G-forces and has a magnetic resistance of 1500 A/m. It has an end of battery life indicator feature as well. The watch is water resistant to 6 ATM (196 Ft) but is not a diving watch so continuous water immersion is not recommended. It is designed for maintaining accuracy at high altitude to 35,000 FT without compensating pressurization. 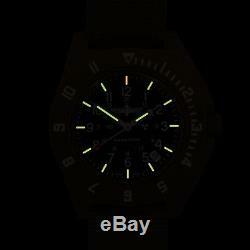 This is the authentic 1st quality military item and not the commercial, military style "Navy Seals" watch available to the general public marketed by Luminox nor the watches manufactured by MB-Microtec (Mil-W-46374F copies). The watch measures 44x48mm (not including the crown) with a 20mm lug width (strap size). This watch is powered by a NEW Eveready Energizer 395 watch battery, and is accurate to +/- 21 seconds per month mine is actually right on after many weeks! By pulling the crown out, the second hand is stopped (hacked) for synchronization. 12 O'clock illuminated in red. Easy to read at night. Watch is manufactured to MIL-46374G specifications. Stainless steel back is stamped as follows. 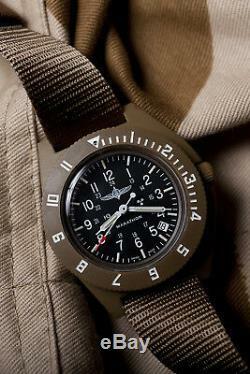 This is a great looking timepiece that is an actual military issue and has met rigorous military specifications. It is not a factory second or government rejected watch. The case is made of an extremely durable desert tan nylon/fiberglass composite material. The rotating outer bezel provides marking for a second-time zone. The crystal is an aircraft quality lightweight Lexon material allowing for strength and scratch removal. The dial features the radioactive symbol (Tritium isotope). Tritium is a radioactive isotope of hydrogen. When it decays, it emits beta particles (electrons) that do not penetrate the skin, plastic, glass, etc. The electrons excite the coating on the vials, creating a bright green glow. It is a safe (but very expensive) method of illumination, and is used mainly in military watches and gun sights. 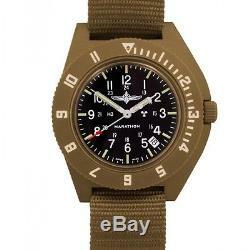 This is brand new and comes complete with matching desert tan nylon flight strap (watch can be worn on the wrist or over one's flight jacket) and original box & instructions! 30-day return privilege after receipt of item if not delighted. Don't settle for imitations or rejected material. Please feel free to contact me with any questions. And pmo are OK too! If you become a new or repeat customer, please take the time to leave. The item "IDF Duvdevan Pilot Watch Marathon Navigator with Date Aviation H3, NEW, Desert Tan" is in sale since Saturday, April 6, 2019. This item is in the category "Jewelry & Watches\Watches, Parts & Accessories\Wristwatches". The seller is "windycitywatchcollector" and is located in Oberlin, Ohio. This item can be shipped worldwide.